I love this delicious dessert and most of the time my Chinese meal isn’t complete if I don’t order this at the end. In Nairobi, my friends Jitesh and Aarty’s restaurant, Taste of China, does fabulous date pancakes worth trying out. Seriously! I tried these out at home. While they didn’t turn out nasty I know I couldn’t compare them to the ones I’ve had at Taste of China. Knead the dough using melted butter & water. Shape into a ball and store in refrigerator. Mince the dates and cook them in unsalted butter. Spread it on tray and allow to cool. Portion the dough into two, roll thinly into individual rectangles. Spread the date mixture in between and seal the edges with little moisture. Cut into neat triangles with help of a pastry cutter, and put back for some time in refrigerator. 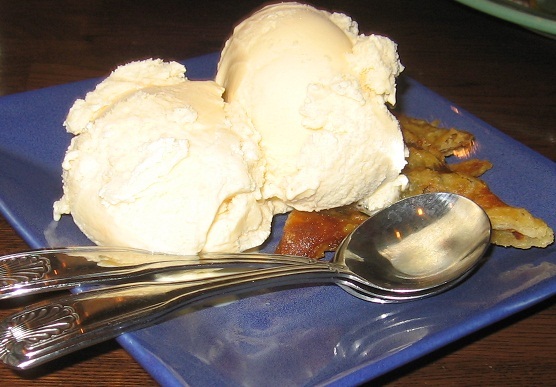 Deep fry in medium hot oil, and cut into four pieces, sprinkle some icing sugar and serve warm with vanilla ice cream.